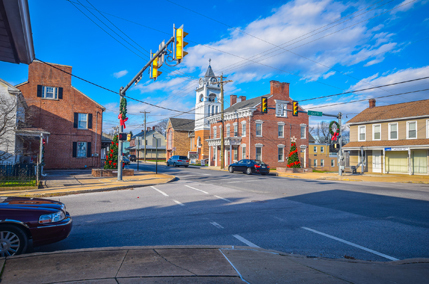 Dover, PA is a small town of about 2,000 residents located five miles northwest of the city of York. The Dover Area School District consists of Dover Township, Dover Borough and Washington Township. The total population of the district is approximately 25,000, which includes about 4,000 Dover School District students. The district is comprised of four elementary schools, one intermediate school and one high school. Dover High students interested in learning a trade have the option to attend the York County School of Technology. Much of the Dover School District landscape consists of farms and other agricultural/rural properties. This makes living in the district ideal for families looking to escape the hustle and bustle of the big city or simply want a slower pace of life. However, the cities of York and Harrisburg are within short commuting distance, giving residents easy access to shopping, dining and other modern amenities. If you’re interested in purchasing Dover School District real estate, you’ve come to the right place. York, PA-based CENTURY 21 Core Partners has a finger on the pulse of the entire York County real estate market. We list a wide variety of homes for sale in the Dover Area School District, including agricultural properties, single- and multi-dwellings, mobile homes and townhouses. We take great pride in being able to offer a home for every lifestyle and budget. CENTURY 21 Core Partners is also proud to represent the prestigious Century 21® brand, which earned the top score among first-time and repeat home buyers in the J.D. Power Home Buyer/Seller Study in 2014 and 2015. This exemplifies our unwavering commitment to providing superior service to our clients. Only about 2,000 people live in Dover, and just a few more throughout the Dover School District. This means you enjoy access to true small-town living and a slow pace of life when you live in this area. When you search for homes for sale in the Dover School District, you’ll want to know where you can find common services. Here’s a look at some of the major service providers in and around the Dover School District. The best options in Dover include Fulton Bank, Members 1st Federal Credit Union and M&T Bank. If you’re intent on finding something else, you can try different bank branches along Highway 74 as you head southeast toward York, including BB&T, Santander and others. That said, right in the heart of Dover, you have access to a commercial bank in Fulton Bank and a credit union in Members 1st Federal, providing plenty of options. As with many areas in Pennsylvania, GIANT Food Stores is the major player — and a good one at that. You’ll also enjoy fast access to Dollar General, Walgreens, Rite Aid and Weis Markets in close proximity. For something a little different, try out Whitecomb’s Farm Market, Stauffers of Kissel Hill Home & Garden Store or Weaver’s Quality Meats — all local businesses you can support. You’ll find most of the shopping in the Dover School District is along Carlisle Road/Highway 74, which runs through the middle of Dover. Most of the businesses here are of the local variety, though. If you’re looking for big box stores and major shopping centers, head to York, where you’ll find the York Galleria Mall and similar venues. Try the Moonlight Café, which is a small Italian restaurant that lets you BYOB. Also, Fox’s Pizza Den and the Route 74 Restaurant serve as local favorites, and you can also find a few large chains like Subway sprinkled through town. Zanelli’s in Dover is another good option if you’re looking for something both local and casual. Brookside Park is adjacent to the YMCA in Dover, and it includes a baseball park. You can also visit Alda Ketterman Park, which is adjacent to Dover Elementary School. And, finally, Dover Community Park includes a field, pavilions, a playground and more. It sits between Dover Intermediate and Dover High School. It’s also located near Zanelli’s, if you want to grab a bite before or after spending time at the park. Like many of the small towns in Central Pennsylvania, the York Fair is the most significant annual event in the vicinity, and it’s a must-visit for anyone within driving distance. Known as “America’s First Fair,” it happens each September, and it draws visitors from around the state. You can waste a lot of precious time driving from one property to another in search of the perfect home. A better way is to use our online tools to narrow your search. Our website includes everything you need to know to make an intelligent property evaluation and “weed out” the homes that don’t meet your guidelines. You can also view photos and take virtual tours to get a better sense of what it would be like to live in the home. CENTURY 21 Core Partners agents possess an unparalleled knowledge of the Dover School District real estate market. Your agent can assist you in locating your dream home and handle all the details during the purchasing transaction. We work hard to make buying your dream home as enjoyable and stress-free as possible. Give CENTURY 21 Core Partners a call at 717-718-0748 for more information about any of our Dover Area School District homes for sale or to schedule a property showing. We also encourage you to attend our weekend open houses to browse our listed properties at your leisure.